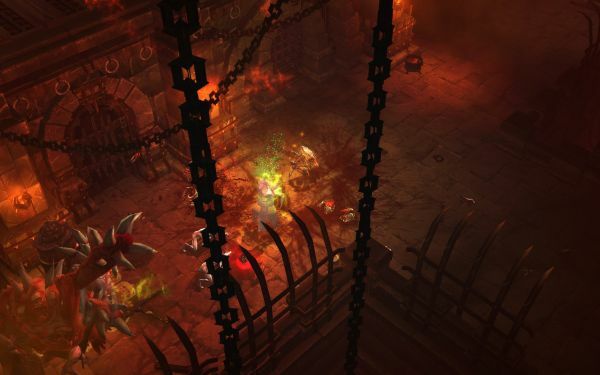 Our likes have been rewarded, and the first batch of new game arts/screens has been posted on Diablo’s Facebook page. It’s a nice update with two new screens and two pieces of artwork, though one of the arts, the awesome painting of the Skeleton King, was previously released on the Blizzcon press CD back in October 2010. You can see the new Wall of Zombies concept art to the right, and if you look closely, the zombies that form the wall look like ancient, rotted Witch Doctors. That’s interesting, since in the game graphics, the zombies are just generic gray-skinned undead. 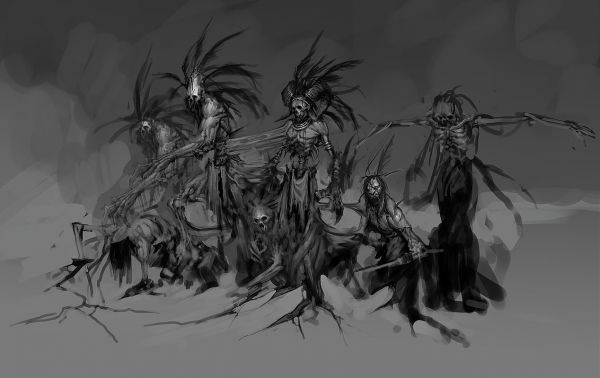 Perhaps the original concept for the skill was something like the Barbarian’s Call of the Ancients, where it summons the undead form of an ancestor for assistance? You know, like Keith Richards in the Pirates of the Caribbean movies. The two new screenshots are below. In the first we see a Demon Hunter‘s Bolo Shot going *boom* and awarding bonus points to the Print Screen timing of whoever took the pic. The other shot shows some Witch Doctor action, with his Poison Dart projectiles going point blank into a Cultist, while an enraged Unburied smashes something (probably a Mongrel) off to the left. We should get another update of these every week or so at the historical “like” rate on Diablo’s FB page, but if you want them sooner, go like it and spam your creepy FB friends to do so also. On the other hand… do we really want the full ransom to be paid out that quickly? I’d rather see a new shot or two every week until the summer, rather than 20 of them all at once. So just in case like, Lady Gaga is reading this, don’t ask your 10 million friends to like it all at once. We don’t need to be the dog that eats a whole bag of dogfood at once, then starves for the rest of the week. Update: The torture room shot seems to show new and improved internal organ gore puddles. 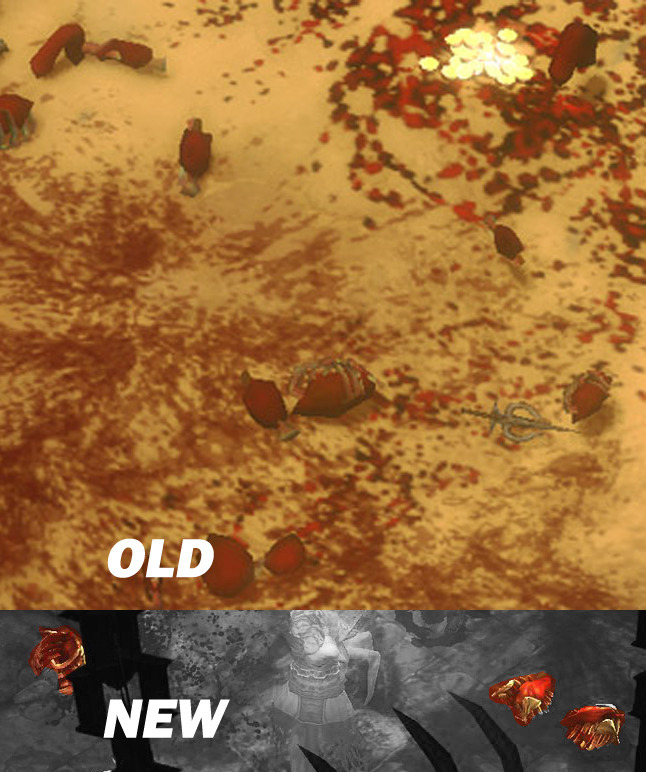 Click through for a screenshot comparison. Image comparison courtesy of EtherealUnity. See the gore article for more such visual delights.